Rabbi Marc Gopin, who lives in America, often works between Washington and Middle East capitals as a seasoned practitioner of citizen diplomacy. I first met him around 2003 in Philadelphia at a conference on diplomacy and international relations. We were breakfasting in a noisy restaurant before the conference began that day, and I felt nervous and out of my depth. In the early stages of research for The Wisdom Project, I wanted to know what Marc, a rabbi familiar with the wisdom tradition and seasoned with years of diplomatic experience, thought about my thesis. I was asking how he, Marc, thought that religious leaders and political actors in Washington and the Middle East – negotiators, mediators, policy advisers, relevant others – could benefit from the wisdom tradition. And how do you yourself do it, Marc, when at times it is like struggling in quicksand? To this veteran peacemaker I must have sounded like a babbling brook trying to explain my inchoate ideas about wisdom as a vital agency for creating peaceable Jewish / Muslim / Christian relations. But Marc patiently prodded, asked questions, and shared moving personal stories. And I listened, hard. High-level initiatives of citizen diplomacy are hugely important to the crucial field of Track 2 diplomacy, which includes dialogue and problem-solving activities aimed at building relationships and encouraging new thinking that can inform Track 1, or official state to state diplomacy. In the best of both worlds, Track 1 and Track 2 initiatives and their diplomats intersect, talk to each other, and join their considerable resources to resolve adversarial relations, conflicts, and wars. At the conference I had already heard Marc speak about initiatives he had been engaged in at this intersection. Amid the bustle of waiters, the clatter of dishes, and the voices of other customers it struck me that I was hearing from someone whom Jesus meant when he spoke of blessed peacemakers. Open, honest, and self-effacing, Gopin shares candidly in his talks and books about the personal struggles he has faced as a change agent in the Middle East, such as in dealing with the moral ambiguities involved in reaching peaceable agreements, the slow progress (when there is progress), the unexpected setbacks, the still unresolved issues. He has been a personal inspiration to me for the promise and potential of wisdom and resilience that people can draw on from deep within to overcome obstacles to peacemaking. Mind you, he wasn’t born that way. He had to get there, had to work hard at it, which for him included overcoming some a very real fear. So, a rabbi walks into an Arab suk. 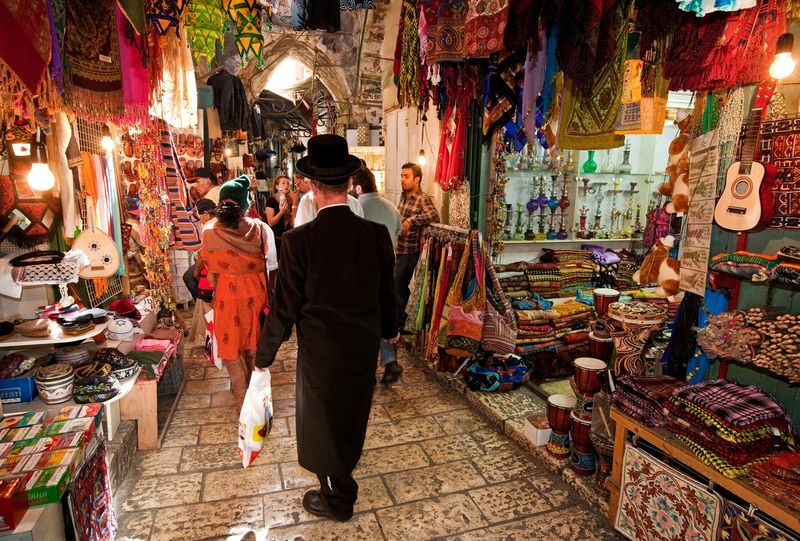 It is the early 1980s, and this “newly-minted rabbi,” as Gopin calls himself in this story, is strolling through Jerusalem’s Old City to the Wailing Wall, when he enters the Arab suk (or souq), which looks like an old-world bizarre. 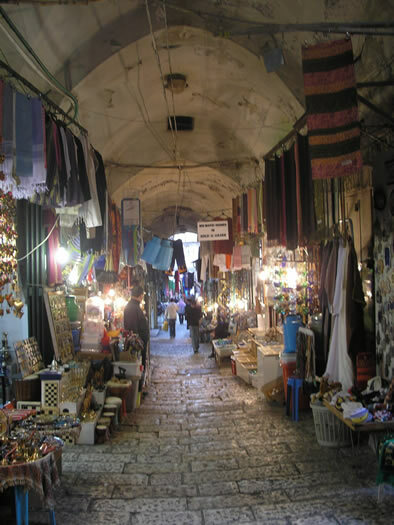 There, he became fascinated with a small, alleyway shop that sold statues of Moses, Abraham, and other patriarchs. Those days, Gopin writes in Holy War, Holy Peace, he was at times “terrified, around Arabs,” so when the Arab shop owner approached him, hoping to make a sale, Marc wouldn’t speak to the man. saw something disarmingly familiar there, and it pained me in its gentleness. First I could not take my eyes off him, but then I refocused on the statues. I saw Moses. My name is Moses. I saw Abraham. And then I looked back at him intensely. The Arab man clearly could barely speak English but seemed not to value speaking very much anyway. I think he sensed I was in pain. And then he did something that will stay with me for the rest of my life. He looked at me, just as I caressed the statue of Abraham, and he pointed up with his finger, and he said, with a heavy accent, “One father?” I nodded, feeling strangely commanded to do so, and I said quietly to him, “One father.” Overcome with emotion, and unable to speak, I said good-bye and walked on. I never saw him again. Gopin later concluded that the powerful symbolic gesture broke down the wall of othering between them (Holy War, Holy Peace, pp. 25-26, for this and other stories). What we hold in our hearts about others is going to show up in our words, gestures, and deeds. As Jesus himself said, underlying attitudes will come out. Marc’s poignant experience is just one of countless reasons why you and I matter to the shapes and conditions of of international life, including the foreign policies of our nations that we support or oppose. We’ll pick this up in the next post. This entry was posted in MOODS & TUDES TODAY, WISDOM, DIPLOMACY & NEGOTIATIONS and tagged Arab suk, Charles Strohmer, Marc Gopin, Old City, Wisdom Tradition by Charles Strohmer (c) 2014. Bookmark the permalink. “One father?” – what a moment! Thank you for sharing this story, Charles. Oh how we need blessed peacemakers! I was in Ukraine in January and have many friends there who are praying for shalom with justice at this tense time for their country. Thank you for taking time to write, John. Some of us here in the States have been trying to follow developments since last Nov., when President Yanukovych nixed a proposed economic treaty with the EU and chose to pursue stronger relations with neighboring Russia. Here in America, trying to determine Moscow thinking about the region takes some effort. You’ve got to look elsewhere than all the special interests, agendas, and polemics of our media and talk radio. But I think we’re getting somewhere. Personally, I don’t believe all the yada-yada here, from pols on both the left and the right, about Putin wanting to resurrect the Soviet Union or that we’re seeing signs of a new Cold War era emerging. No doubt some pols and influential others here would like everyone to think these things are true, as it would then be much easier to manipulate domestic opinion here to further isolate Russia and push foreign polices through Congress that militate against shalom with justice. Of course Putin is aptly engaged in his own foreign policy moves. I may be wrong but, despite indications of a worldview in which a mystical vision for Russia holds a high value, not unlike American Exceptionalism does here, Putin seems to be a hard-nosed rational political actor who decided he had to have Crimea and calculated that would get it by his opening chess moves toward Ukraine — assuming he wouldn’t win that but would get what he, and apparently most Crimeans, wanted. If so, I suspect this foreign policy move was hatched between Moscow and Simferopol who knows how long ago. Its success brings Simferopol into political orbit around Moscow as part of Putin’s Eurasian Union policy, by which, as you also know, he hopes to bring as many former Soviet capitals as he can formally into Moscow’s orbit to compete with the EU. Meantime the people in the region suffer and there are no signs where it’s headed, that it will end anytime soon, or it won’t escalate. Prayer for shalom with justice is indeed needed. I agree with you that some politicians and ‘influential others’ in the West would like us to think in terms of a resumed Cold War … and I guess part of that has to do with the money that is to be had from making swords rather than ploughshares! I think too that there is an undoubted mystical vision for ‘Mother Russia’ and that it is combined with a cold rational chess-playing mind. I guess that you have heard that the acting President of Ukraine is a Baptist church elder who clearly believes that Christians should be involved in politics. With presidential elections coming up soon, he won’t be long in that position but, in the meantime and perhaps more behind the scenes afterwards, let’s hope and pray that he may be a shalom-maker when there are some from the extreme Right there who seem not to care too much about peace as long as their agenda prevails. With my three-score-years-and-ten date approaching in May, I may well be a bit ageist in asking this but is there a general need for respect for the experience of the aged in politics? Young fire-brands often turn into elder (and wiser) statesmen (and women – why do we only say ‘elder statesmen’?!). Coming from Ireland as I do, I think of the change in Ian Paisley when he moved into his seventies (and wish it had come sooner!). My wife and I were in Mogadishu, Somalia, when the military coup happened that brought Siad Barre to power. He pursued a policy of systematically depriving the tribal elders of their influence and so, when he eventually fell, it was young ‘warlords’ who immediately took up arms against one another and the lovely people of that poor land have been living with the consequences ever since. Father Abraham had many sons, many sons had father Abraham…so goes the Sunday School chorus. Thanks for your essay Charles. I take Muslim international students learning English and look for ways to connect with them. You writing is encouraging. Thanks! Glad you stopped by. I appreciate your note. Thx for taking time to write it. Your work sounds interesting. Hope to see you here again, and your friends.